Barack Obama vs Paul Ryan: Who Is Moving Us in the Right Direction? Several weeks ago my post, “How to Improve America’s Welfare System,” described a new proposal from the House Budget Committee (Chair, Paul Ryan) to let selected states experiment in consolidating separate federal programs such as SNAP, TANF, child-care and housing assistance programs, into a new composite Opportunity Grant Program. The idea is to let participating states choose qualified providers who would then be held accountable for moving people off of assistance, out of poverty and into productive employment. 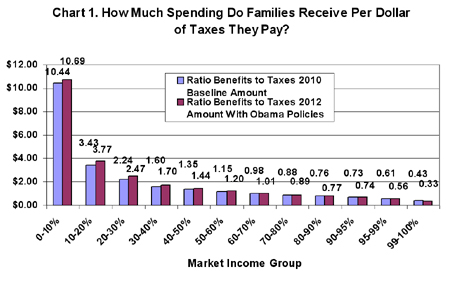 As it stands right now, we’re making people more dependent on government programs. Instead we should be helping them become more independent and more capable of supporting themselves on their own. This would improve their quality of life. Our federal government is spending way too much money and not collecting enough tax revenue to pay the bills. According to report after report from the Congressional Budget Office, the trajectory of growing debt is getting much worse and the problem will become harder and harder to rectify as we continue down this path. My natural inclination is to be optimistic that our political process will respond to this bleak current path we’re on and that things will be turned around before we have another financial crisis. But it is easy to imagine a course of events where this does not happen. It’s clear what we need to do but how will this get done? This entry was posted in Barack Obama, Congressional Budget Office, controlling spending, Jack Heidel, Paul Ryan, poverty, Tax Foundation, welfare, welfare reform and tagged chinese proverb, congressional budget office, debt, government benefits, jack heidel, tax payments, welfare reform by jackheidel. Bookmark the permalink.